New year always means new intentions and setting a new vision or goals for where you’re headed. Now, one can argue that you should be doing this all throughout the year, but most of us just do this once a year, and right around this time. It really is one of my favorite things to do. I have been picking a word or phrase for my years for a long time. My word for 2016 was SHINE. And I’ve been setting intentions since I turned 30: 30 in my 30s. Last year, my word was intention. I wanted my moments to be purposeful. My friend Jenny sells Keep Collective jewelry. I love it so much, I have many pieces and love to give them as gifts. The fact that you can personalize it makes it so much more meaningful. I love the engravables, because I can choose a word or words to help me remember where I want my focus to lie. I just got this and have been wearing it non stop. I try to surround myself with this word or phrase that I choose as much as possible. For example, I put it as the backdrop of my phone. I love using word swag to design little sayings and graphics to help me remember things. 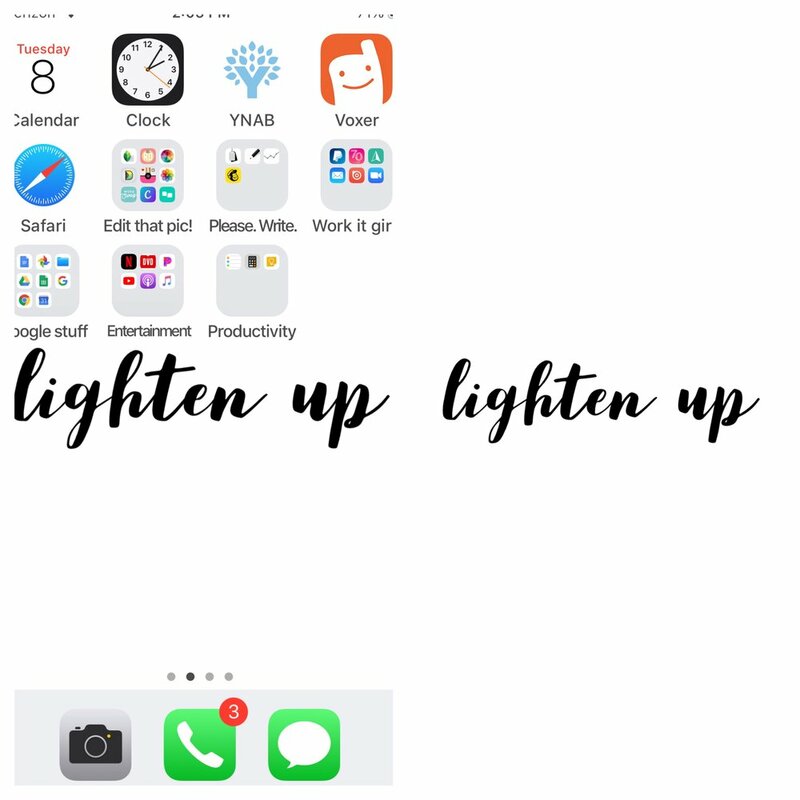 I pick up my phone 60+ times a day (read about my phone addiction here), so putting my phrase as the screen saver and the back drop ensure that I’m seeing it A LOT. Do you pick a word for the year? If so, tell me what it is and how you emerse yourself in it and use it to help you throughout the year! As I was picking up our endless piles of papers, and drinking cups and bottles scattered throughout the house, I started to think about less. If we have less, we use less. The less options we have, the easier it is for our brains to make a decision. I have found over the years, that the less cloths I own, the easier it is to get dressed in the morning, as long as the clothes I do have fit me well and make me feel good. Dave and I did a cup experiment to test if this theory about decreasing your options really did make your life a little easier. The amount of water bottles, coffee mugs, tumblers, and to go cups that were in our cupboards was ridiculous. We would just grab a bottle, take it with us, and leave it in the Jeep or truck, or in a bag. Then we would spend time gathering up all of our bottles that needed washing, then washing and filling them all up again. And the same for cups and tumblers. I was noticing I was wasting a lot of time managing all of this drinking receptacles. How silly is that? So, I assigned a Tupperware water bottle and one drinking cup to each of us for the entire week. We were responsible for keeping track of it. I had big hopes this would reduce the amount of picking up that I do. It worked! We both brought our water bottles or drinking cups with us where we went and remembered to put them back so we would know where to find them again. Decreasing our options for cups helped me see how I didn’t miss the extra things in the cupboards, in fact, I loved not having to use the brain power to decide which coffee mugs I wanted to use. I only had one choice. I wish I could say I invented this idea. It’s not a new concept. In fact, back in the day Dave and his roommates did something similar in college. There were 3 boys living together, and none of them were very great housekeepers. Their kitchen mess got out of hand easily, and no one would clean it for days, only making it worse. So they came to a solution: each guy would have their own set of dishes: fork, spoon, plate, cup, And they were responsible for washing it. Dave said it worked beautifully. They decreased the options and became a little more responsible about the one set of dishes they had to use. Decreasing your options works to create ease around decision making and makes you more grateful for what you have. Pick one thing in your home, and limit your options. Start small. Clear out all of the coffee mugs from your cupboard. Put them in a box and set aside (you don’t even have to commit to getting rid of them--yet!). Then choose your absolute favorite. That’s your mug. You will only use that mug for coffee for the next week. Report back to me after you’ve completed this assignment. Better yet, don’t, but since it worked (see, I’m that confident that it will) go do this with something else in your house (like your scarves, or your jewelry). Pretty soon, you will have so many less options for yourself, and so much more time to be spending on the important things in life. My journey to lightening up my cleaning products and skin care has been over the course of many years. It started back when I met Dave and moved in with him. I had never had my own home before, and I became more interested in my health. That snowballed in to reading lots of books about hormone disruptors in our daily lives. One of my favorites is Jillian Michael’s book Master Your Metabolism. I didn’t realize it, but deep down I knew we were going to start a family and I didn’t want anything disrupting my hormones for pregnancy, or anything that could potentially harm my child once they were here. Little did I know that we would struggle with miscarriages and this would become even more important to me in the following years. Gradually I transitioned to more all natural, homemade alternatives for my cleaning products and skin care. I had fun researching new recipes, and testing them out. As I trialed, I also compiled all of the recipes into a handy little book, and now I’m sharing it with you! About a month ago, I spent a morning creating 2 little mini wreaths at the Carlson tree farm. I love how my wreaths turned out! I had such a lovely time connecting with Michelle and her gang at the Tree Farm. And a huge bonus are the cutest puppies and kitties you ever did see. If you’re looking for a super cute soft tee shirt, this is it. It was such a great experience and I’m proud to call Michelle a friend. Her talent and vision is apparent at the Carlson Tree Farm and I love connecting with her about small business and family succession. Have you been to the Carlson Tree Farm? I take a lot of pictures, but as I was deleting and cleaning out, I decided to look back at the last week, and pick my top 5 from the week. Meditation can be an intimidating thing. We all know it has countless benefits to our health and well being, but sitting in mindful silence often generates even more stress than we were experiencing before...am I doing it right?...how long has it been?...my legs are falling asleep...what am I going to make for supper? Oh the things that bounce through our minds when we try to think of nothing at all! Technically, mindful meditation isn't really thinking of nothing at all, but rather noticing and thinking of everything at once - which can be even more confusing and frustrating. For those of us with incredibly busy minds, all the good things that come from meditating aren't completely out of reach. Often, switching up the style or method of the practice is all we need to do, and the yogic method known as japa mala seems to be one that clicks for many people. Japa (in Sanskrit) is the meditative repetition of a word or phrase. A mala (meaning garland) is a strand of beads, usually 108 of them plus one larger one, often with a tassel at one end. This is used to count the repetition of that word or phrase. Put them together, and you have japa mala. When practicing japa mala meditation, your mantra (that word or phrase), can be anything that resonates with you. Words have such power and intention, and the act of sitting quietly while repeating them over and over is a beautiful way to tap into that power. Maybe you're drawn to a traditional Sanskrit mantra, maybe it's simply a word such as love, compassion, kindness, etc. That's the beauty of japa mala...you can make it your own. If you're looking to give it a try, you'll first need a mala to use in your meditation. Of course the internet can be a great resource for this, and you'll find everything from inexpensive wood beaded ones to more pricey gemstone varieties. If you're the crafty type, you can even make your own. Once you have your mala, you'll need to decide on a mantra that feels meaningful and right for you, and then you're ready to begin. Finding a quiet and comfortable place to sit is important, this could be on the floor or even in a straight-backed chair. To help you sit still for meditation with ease, try stretching a bit beforehand - this was even the original purpose of yoga poses! Then, holding your mala in your right hand, let it drape over your middle finger. Try to keep the index finger out of the way. This finger represents ego, which is detrimental to your meditation practice. See that bead just above the tassel? It's often larger than the others. That's called the guru bead. Pause here, letting the guru bead balance on your middle finger while you take a few deep breaths to center and prepare yourself. Then, using your thumb, pull the next bead toward you...and now you begin repeating your mantra aloud or internally. As you mindfully make your way around your mala, you'll fall into a blissful rhythm of sound and movement. Before you know it, you'll have repeated your mantra 108 times and reached that guru bead once more. Pause here again, let the power of your mantra and your meditation practice sink in, and then take a few deep breaths in gratitude to finish...or go around again. Like with anything else, making meditation a regular part of your routine takes some time, dedication, and commitment. With that, japa mala can become one of the most meaningful parts of your day.